Does The Maples Assisted Living, Inc offer the following services? Choosing The Maples Assisted Living is like choosing an old friend. 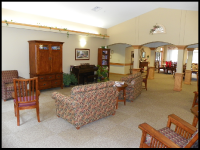 The Maples Assisted Living is designed with our tenants in mind. Our schedules and activities are centered on your desires. With personal cares of your choice, your independence with be enhanced in our warm, safe, home-like environment.